Though 1 Enoch is not in either Jewish or Christian canons, its ideas were highly influential in the first century. In fact, in Reversing Hermon, Michael Heiser argues that many of the details in the New Testament “can only be traced to 1 Enoch” (p2). 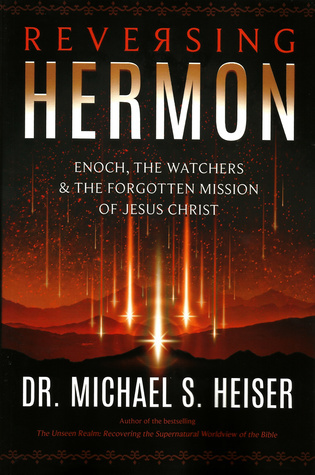 Though Heiser is not alone in this claim, it will be a new idea to many and Reversing Hermon is an accessible presentation from an expert in the field of all things weird in the Bible. Chapter one convincingly defends the supernatural and traditional interpretation of Gen 6:1-4. In this view, heavenly beings (“the sons of God”) had sexual relations with human women. The second chapter introduces 1 Enoch and its commentary on the Gen 6 event. It is seen that the Watchers “served as a catalyst to spread wickedness among humanity” (p32). Chapter three finds close parallels to both Gen 6:1-4 and 1 Enoch in ancient Mesopotamian beliefs. Chapter four argues that “astral prophecy”, a conservative astrology of sorts, predicted the coming of Christ. Reading Rev 12:1-7 as presenting historical astrological signs results in dating Christ’s birthday as Tishri 1. This is the same birthday as Noah’s. To Heiser, this communicates that Christ is a new Noah and bringer of judgment upon the Watchers. That Rev 12:1-7 refers to star signs is fascinating and worthy of further consideration. Chapter five interprets the four Gentile women in Jesus’ genealogy in light of the sins of the Watchers. This results in a divine irony that they would spawn the Messiah. Heiser holds that these “connections are both thematic and textual…[which] can hardly be a coincidence” (p86). To my eyes, these connections were tenuous at best. Chapter six explores the ministry of Jesus, the importance of Hermon, the origin and defeat of demons, the transfiguration, and “the gates of hell”. I found many persuasive and illuminating insights here. Chapter seven suggests that the Law was given due to the transgressions of the Watchers. In Gal 3:19, since Paul “refers to plural transgressions, and not merely Adam’s Fall”, he must be thinking of the Watchers (p117). I find this logic mind-boggling. There is no mention of the Watchers in this text, so it must be imported from elsewhere. What’s more, it is better to see the transgressions as Israel’s. John Sailhamer rightly observes that the Torah itself bears this out, where law units regularly follow narratives of Israel’s sin. Chapter eight draws on first-century medical texts to explain Paul’s teaching on head covering (1 Cor 11:2-16). Put simply, Paul followed the science of his day that believed women’s hair was considered genitalia. As modesty was required in a worship context (Ex 20:26; 28:43), women ought to cover their hair. This also explains 1 Cor 11:10, since the Watchers fell due to their lusting after women. This chapter is another highlight. The genitalia suggestion surprisingly (!) makes sense. However, I’m not yet sure if it makes the best sense of the context, such as 1 Cor 11:3. Chapter nine explains the connections between baptism, salvation, Enoch, the spirits in prison, and the flood in 1 Peter 3:14-22. Chapter ten shows that ancient Jews believed the Antichrist “ had clear conceptual links to the sin of the Watchers and the giants” (p147). Perhaps the readers of Revelation already held connections with “fallen Watchers, the classical Titans, and the giants” (p162). Perhaps. The suggestions in this chapter are a mixed bag. Chapter eleven examines Enochic connections with Revelation itself. The unlocking of the Abyss (Rev 9:1-10) is the release of the Watchers. The 144,000 are “counterpoints” to the adulterous Watchers (p167). Finally, the lake of fire (Rev 20:10; Matt 25:41) finds its origin in 1 Enoch 10:9-15 and 21:1-10. Some of the connections to 1 Enoch are inescapable (the Abyss and lake of fire), but others are uncertain (144,000, Dan). Heiser is right that the church has neglected the import of Gen 6:1-4 to the NT and first-century thought. However, due to the high degree of speculation in Reversing Hermon, I ironically finished the book feeling less convinced of Enoch’s influence! That said, there is a recent swell of scholarship comparing 1 Enoch with the NT. I suspect the issue, then, is either the choice of themes or the popular-level approach not allowing for thorough argumentation and evidence. As to the former, I find textual allusions to be more objective than supposed thematic similarities. As to the latter, perhaps one should not be too pedantic due to the audience for this book. It’s true that this book is grounded on peer-reviewed scholarship. In fact, chapters or sections are highly dependent upon individual scholars. For example, chapter three draws liberally from Amar Annus’s article. Chapter five “is based primarily” (p294) on Amy Richter’s dissertation. The main suggestion of chapter seven is from Tyler Stewart’s paper. Chapter eight’s argument is largely the work of Troy Martin. Even chapters one, six, and nine are heavily drawn from Heiser’s own Unseen Realm! Block quotes abound. Reversing Hermon often feels like reading a summary of other works. Heiser claimed that “This is not a book filled with speculation” (p4), but I am skeptical. Yes, Heiser relied upon peer-reviewed scholarship and his own expertise in ancient languages and culture. Reversing Hermon is utterly unlike the rampant speculations of virtually all popular-level books on such topics. This should not be quickly overlooked. However, as a serious student of the Bible, I found the biblical connections to be frequently spurious. That, and the heavy copying from other works, are my most significant complaints. This critique pains me, as I am a tremendous fan of Heiser’s work and hope that all readers of this review would go buy the fantastic Unseen Realm right now. I recommend Reversing Hermon to those particularly interested in 1 Enoch but not in reading scholarly works. For most, I would suggest the far superior Unseen Realm (review here) and Naked Bible podcast. Despite my critique of Reversing Hermon, this is a book that will serve as an introduction to Heiser, and for that I am delighted. Many thanks to Defender Publishing for providing a review copy.